After testing out my last shoe and realizing that running shoe was strictly a road racing shoe I saw the need to buy new trail running shoes since my last ones have gone WAY beyond the call of duty-and their recommended mileage! My husband even noted those old trail shoes appeared to be wearing through the soles-oh my! That was just the excuse I needed to drop by a sports store and try on running shoes. A word about the sport store. The guy who was assigned to the shoe area clearly had next to no real knowledge of current running shoe trends. As soon as he said the words "if your feet pronate (roll inward-which our feet are supposed to do to a certain degree) you need motion control" I rolled my eyes and realized there was no help there. I tried on just about every brand the store sells and was really pleased to see some of the more hard to find brands in stock. It's a slow process finding the "right" shoe and I did more than a couple of laps around the shoe department testing the feel of each shoe. 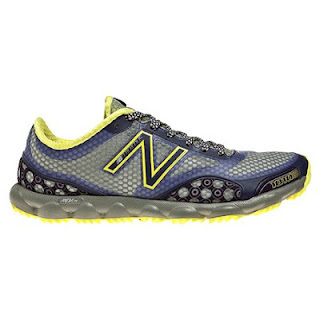 So I finally settled on the New Balance 1010 for a few reasons; the traction appears excellent for a Vibram sole, the toe box was spacious so I could see it handling swollen feet after 40 kms, the response from the shoe was very good when I hopped from side to side, stopped suddenly and changed direction, and the overall weight of the shoe was on the light side of standard trail running shoes. My first run in the New Balance 1010 went okay, not as great as I had hoped, the whole time it felt like I had on alot of shoe, even though these shoes are pretty lightweight, but then again the run was only on roads. The second time I made sure to run along some local trails and was very impressed with the responsiveness of these shoes. Seriously, it was really noticeable how much better traction I had over previous shoes. After a couple of runs I don't notice the clunckiness I felt during the first run so I chalk that experience up to me simply adjusting to a new shoe. I'm now training in these shoes for my first of two 50 km trail races this year. The New Balance 1010's get 5 out of 5 stars from me, for comfort, response, traction and stylish but not overbearing color-no neon here!